Case Study: How do you clear blocked drains and pipes? In this case study we highlight some of the questions we ask customers in order to find the best solution for clearing a blocked drain (pipe, or sewer). Water is very slow to drain from kitchen sink. Water backs up and is very slow to drain from laundry tubs during washing cycles. Gurgling sounds come from the kitchen sink when the washing machine is draining. Occasionally, odours come from the kitchen sink, similar to that of used water from the washing machine. Realising there is probably a blockage in the pipes, James decides to attempt to clear the blockage by using (a) a plunger (and breaking it! ); (b) and a number of off-the-shelf products; and (c) some home remedies based around bicarbonate of soda, vinegar, and boiling water. With much hope and anticipation, but to no avail, James found none of these DIY remedies worked in clearing the blockage. » Have you engaged a Plumber to look at the problem? If not, we may advise calling a Plumber first, or suggest you try a number of “test and note what happens” suggestions (e.g. fill the sink/laundry tub with water and let it drain while observing the water flow/trickle from the sewer inspection shaft or boundary trap). » Is there access to the site? Together with the answers to the above questions, this will help us determine what vehicles and equipment are best suited for your situation. Online Pipe & Cable Locating has a range of equipment and technology to remove blockages. Whether some or all of these are used will depend on the situation and the customer’s requirements. CCTV cameras ranging in size to suite most pipes, drains and sewers. 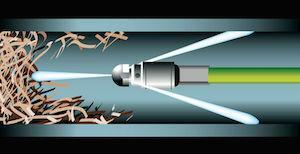 CCTV inspection is the best non-destructive way to look into pipes and see exactly what the situation is. Live footage (and recordings) together with information about the blockage can help our technicians determine the cause of the blockage (in this case tree roots invading a cracked pipe and greasy sludge) and options to remove it. Water Jetting – We have a range of high pressure water jets to break up and clear blockages. Water jetting is a safe, effective, and fast method of removing blockages with little or no impact on the environment or the pipes being cleared. Vacuum Loading – Debris, waste and sludge can be removed from site and disposed of safely with our vacuum loading trucks. For James’ particular problem, Online Pipe & Cable Locating provided CCTV camera inspection to determine the cause of the blockage (tree roots and greasy sludge), as well as water jetting to break up and blast the tree roots and sludge through the pipe until they could be removed from the vertical inspection shaft. With the blockage removed, full water flow was restored and elimination of all problems as identified in 1-4 above. For more information, or if you have further questions, please call us on 1300 665 384.